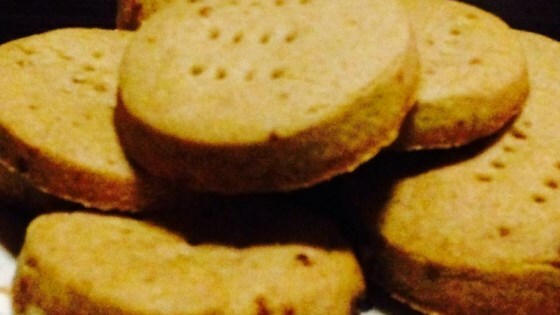 "A yummy, melt-in-your mouth, cinnamon spiced spin on the traditional Scottish cookies." In a medium bowl, stir together the flour, brown sugar, white sugar and cinnamon. Cut in the butter until the mixture is like fine crumbs. Pack the crumbs into a ball, then knead by hand until smooth. On a lightly floured surface, roll the dough out into an 8 inch circle. Place the circle on a baking sheet, and slice into 16 wedges. Leave the circle intact. Bake for 25 minutes in the preheated oven, or until the center has set. Cut the circle into wedges again while it is still warm, and transfer to a wire rack to cool. So irresistible yet shockingly simple to make. These are devine - first shortbread I could get to work - I made mine with whole wheat flour. I made it and it disappeard at the speed of light! This was nice shortbread, but did not taste particularly "spiced" to me.